The VW Golf GTI is kind of a cult hero in the car world. It's the car that started the whole hot hatch revolution. A watershed moment in car history. Its brother is the Jetta GLI, which seems nearly forgotten. But it shouldn't be, because it's a seriously fun little car. The newest VW Jetta has a goal: Help VW become the biggest automaker in the world. Costs were cut and the Jetta was moved to fight the Corolla head on. That means it had a substantial beige-ening in some areas that used to be a mark of VW's German craftsmanship. Like that Confucius fella said, before you embark on a mission of beige revenge first dig two graves: one for your enemy and one for your enthusiast creds. VW put in the anemic 2.5 liter five cylinder engine and ripped out the multilink rear end. Instead, it got a torsion beam rear axle. All of this spelled doom and gloom for the GLI and performance faithful. But VW didn't want to anger them. So what they did for the GLI faithful was rip out the five cylinder engine and replace it with their now common 2.0-liter turbo four. Then they decided torsion beam was a bad idea and put the multilink setup back in (which is something all Jettas will get for 2014). Voila. The GLI is now a GTI with a trunk. I wasn't expecting to enjoy the GLI. In all honesty, the only Jetta I've ever desired was the TDI Cup, and that was just a sticker package and a different bumper. This one might not look as good as the TDI Cup did, but I bet it drives way better. It's in the running for the most surprisingly enjoyable car I've driven this year. VW's goal with this Jetta was to take on the Corolla. I've said it at length, but this means it needed to have a broader appeal. A beiger appeal, if you will. It is jazzed up a little from the stock Jetta with foglamps, big wheels, honeycomb grille, and glossy bits all over. The badging is also subtle. I think it's an attractive car. The little changes actually bring it all together. Where my particular car fell flat was in some of the carryover parts that come from the base Jetta. Especially the headlights. You don't think about it a lot, but the headlights are the face a car shows to the world. And in a generation where LEDs have to exist on every car, this top-of-the-line Jetta had halogen daytime running lights. They look atrociously bad when they're on, like it has some sort of eye infection. LEDs are available as an option, but they weren't on this car. I'm someone who has ridiculed the proliferation in LEDs in cars in the past, but when you see one without them, it really makes you realize just how prevalent they have become and how used to them we are. Too bad there's no way to turn them off without pulling a fuse. It's a mixed bag in here. The wheel is great, and that's because it's the same thick, flat-bottomed sucker as in the GTI. The dash is also a softer touch plastic, that's not too bad either. But the doors are covered in this hard plastic that is rough to the touch. The seats aren't the best either. For one, they need more bolstering, because they don't hold you in under aggressive cornering. They're also kind of short, so longer legged chaps get uncomfortable after a while. The passenger seat isn't fully electric either. It's the little details that get to you. Thankfully, the GLI is still a fine performer. The 2.0-liter turbo four has 210 horsepower and enough grunt so that it never feels underpowered. Torque steer is fairly minimal, it exists, but is more like a suggestion than an order. It does spin the tires fairly easily off the line, which isn't exactly what I expected. But once it hooks up the GLI rips through the gears with no problems at all. You aren't setting the road on fire here, you're driving a semi quick Jetta. Solid pedal with a good feel. I did find that ABS intervenes a little early but it stopped plenty fine in every situation. It's not an aggressive pedal or setup that will make your eyes pop out of your head, but it is a stronger than average brake that will keep you out of ditches or the back of trucks... If used correctly. With a torsion beam, the Jetta lost a bit of the civility the Jetta was known for. The GLI's setup makes the Jetta a citizen of the world again. This is a premium compact sedan, it can't ride like a piece of wood. Ok, now you're saying you like pieces of wood and that you sleep on a hard bed and blah blah blah. But don't you really like something a little softer for a long journey? If you were bedridden for months, would you rather be on a pillowy surface or a steel girder? Pillows for me, please. At a nice cruising speed, the ride of the Jetta is Goldilocks-esque. Not too hard, not too soft, but just right. At higher speeds, it does get a little higgeldy piggeldy and bouncy, but those speeds aren't legal and you shouldn't be driving it that quickly anyway, unless you're on a track or hoping to taunt the NYPD. And if you're on a track you would have changed the suspension. The GLI is surprisingly decent. But then again, I guess I shouldn't be that surprised since the GTI also handles excellently and shares a lot of features with the GLI. Unless you really, really push it, the GLI is pretty neutral with just a touch of sluggishness out of the front end. I'd imagine if you really entered a corner hot, it'd push and scrub a ton of speed before it got turned. And when on the road are you pushing a car so it understeers or oversteers in a Jetta anyways? VW were amongst the originators of the dual clutch transmission, and this latest version of DSG is one of the best out there. It's not quite PDK levels of amazing, but it's as close as you're going to get in a car that costs a mere $28,000. Shifts are fast, immediate, and nearly telepathic. It's definitely one of the best gearboxes in a performance economy sedan that you can buy today. In automatic, it's smart and shifts when you want it to. It's still a little jerky at lower speeds, but that's the price you pay for sportiness these days. The engine itself has a nice little burble and slightly throaty exhaust note, but it doesn't make the hair on your neck stand on end. It's actually a little too subdued for my taste. VW licensed the Fender brand for the stereo in here, and it isn't bad, but it's just a name since Fender doesn't really make stereos. I'm nostalgic for 2003 and the days of the Monsoon Stereo in a Jetta blasting some Sugar Ray. Ah to be 17 again. I think I'm being a little generous here with a six for toys, since the GLI doesn't really have a lot to brag about. It has the DSG trans, satellite radio, cruise control, and not much else. But do you need much else? No. Not really. 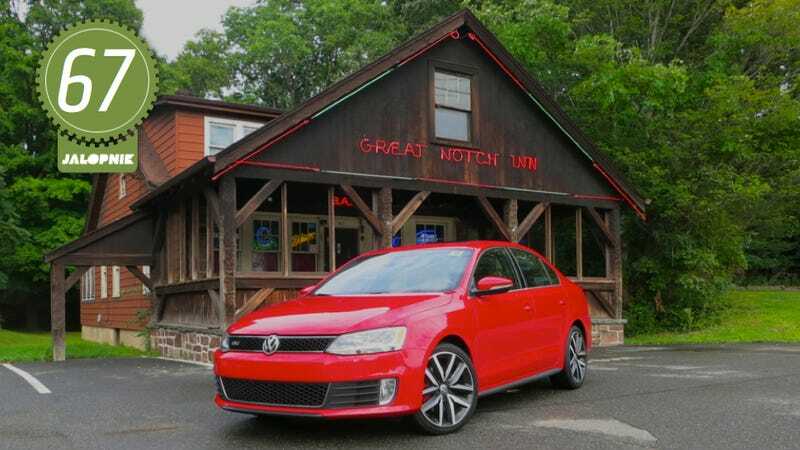 At $28,000 for this not close to fully-loaded Jetta GLI, you'd think I'd be saying this is a terrible deal and you have to get the Scion FR-S instead. But I'm not saying that. Even though it might not be reflected in the numbers, the GLI is an engaging little SOB and a lot of fun to drive. As my Dad and I drove up to Lime Rock Park last weekend, we determined that the GLI was pretty much all the car 99 percent of people need. Now, I'm not saying that you can't buy more, I encourage you to do so. But if you want a practical performance car that can seat five, stick like mad in corners, and accelerate off the line quickly, you don't need to look much further than the GLI. I bet you could also take it for an autocross and have a blast. Then you could pick up your girlfriend, go out to dinner, and hit up Costco. If you only have the budget for one car and need to do a lot with it, oh, and you're hatchback averse, the GLI is a truly great choice. And that's something I didn't think I'd say at all.